View More In Spray Guns & Accessories. 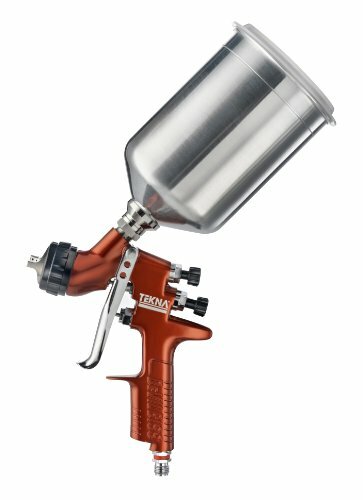 The TEKNA Copper Spray Gun comes with a 900cc aluminum cup, 7E7 High Efficiency Air Cap, 1.3mm and 1.4mm fluid tips, gun wrench, color ID rings and digital gauge with air adjusting valve. Find your perfect finish with the TEKNA Copper Gravity Feed Basecoat/clear coat Spray Gun, by DeVilbiss. Precision: Slicker clears, superior metallic control, better blends. Even material distribution for fewer coats, increased productivity. High transfer efficiency - saves materials, saves money. Digital gauge for accuracy and repeatability. Waterborne compatible. Versatility: 4 models to choose from: cupped or uncupped, with your choice of 1.2/1.3mm or 1.3/1.4mm needle/nozzle sets. Waterborne basecoats - All Climates. Solvent basecoats - All brands. Clear coats - High, Medium, and Low Solids. If you have any questions about this product by Tekna, contact us by completing and submitting the form below. If you are looking for a specif part number, please include it with your message.